The 40 Lunches Project has made it to the half way mark. When I talk to my students about creating compelling characters, I tell them that a good protagonist is always active rather than passive. When we think back on our lives it is easy to place ourselves in the passive role. This happened to me. This person did this to me. 40 Lunches has forced me to look at myself as an active character. What did I do? What role did I play in this relationship? Launching 40 Lunches has been one of the best things I’ve ever done for myself. It has challenged me to confront some of the most difficult moments in my life, reflect on friendships, and boldly reach out to people I wanted to connect or reconnect with. It has given me an opportunity to say thank you to most and I'm sorry to some. It has forced me to put those experiences into words and to consider the part I played in each story. It has also given me a weekly writing assignment (more or less) and deadlines to meet. But I’ll admit that I have hit a slump. Keeping up with the weekly posts has been a challenge when I am also juggling work and parenting. So now, in addition to thinking about what I want the next 40 years of my life to be, I am looking at my immediate future as well. How can I make the last half of 40 be the best it can be? There is a lot I don't know, but what I do know is that there will be travel and adventure. I'll open a new play in San Francisco and workshop another in Omaha. I’ll be visiting with guests in San Francisco, Los Angeles, Washington DC, New York, and Alabama. For many of the upcoming lunches I’ll be visiting with friends I haven’t seen in years. But when I launched this project I knew that in addition to reconnecting with people who shaped the first 40 years I wanted to reach out to people who I hope will inspire the next 40. Many of my remaining lunches will hopefully do just that. The best part has been the support of the people who have been following the project, the people who share my posts with others, and take the time to make a thoughtful comment. It’s been interesting to see the ways in which people connect and relate to the stories I am telling. Have any of these stories inspired you to reach out to someone in your life? If so, drop me a line and tell me about it. 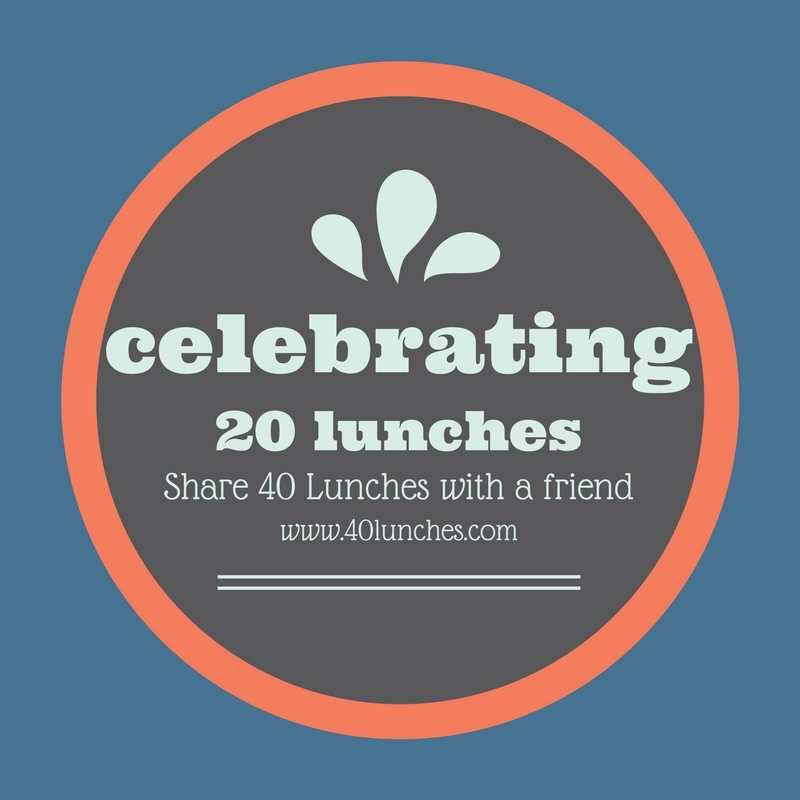 Have you enjoyed reading about my 40 Lunches? Like the project on Facebook and share it with a friend. Oy, yes, truth on the metabolism! I'm following along and have been enjoying all the entries.